This is the Twin Cities Muzzle Loaders Club big yearly event. See history come alive with fun for the entire family! Join us at the rendezvous site (Map)--just west of Cannon Falls. 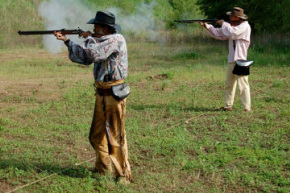 Participant--become one of the re-enactors helping history come alive. Click here for the 2019 participant information. Guest/Public -- Experience a fur trade encampment typical of the period from 1750-1840 and visit with re-enactors portraying the many unique characters that gathered after a winter of trapping to trade goods, test their skills, and swap tall tales with their friends.